Eileen Healey filming in the Alps, 1950s. Courtesy The Daily Telegraph. This month, as the Royal Geographical Society marks the centenary of Robert Scott’s tragic expedition to the South Pole, it is all too easy to view exploration as ‘a man’s sport’. We conjure images of Scott, Shackleton, Hillary and Norgay, and Fuchs, bravely fighting the elements in their attempts to overcome the earth’s extremes. But women’s vital roles in the history of exploration has received considerably less attention. In the most recent issue of Transactions of the Institute of British Geographers, Katherine Brickell and Bradley L Garrett (Royal Holloway, University of London) sought to address this discrepancy. Their article chronicled the work of women in filming expeditions during the great age of Himalayan mountain-climbing (c.1930-c.1960). 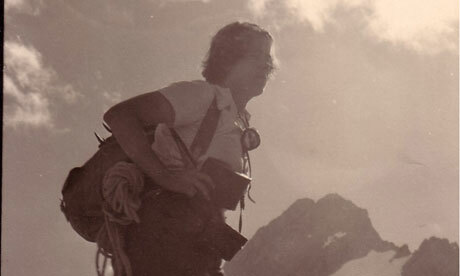 Acknowledging the important use of film in nineteenth and twentieth century exploration, Brickell and Garrett recalled the experiences of Eileen Healey, ‘a visionary British female mountaineer and amateur filmmaker’, who died on 8 September 2010 at 89 (1). In the summer of 1959, Healey joined nine other women, led by Claude Kogan, a French swimwear designer-turned-alpine climber, on a expedition to the Himalayas. They hoped to climb – and film for all to see – Cho Oyu, the world’s sixth-highest peak. The expedition, which began amid tremendous media furore, horribly ended when an avalanche killed Kogan, the Belgian Claudine van der Stratten, and two male Sherpa guides. After the disaster, she kept her 16-mm film stored in her house; according to The Guardian, it was not publicly screened until a half-century later, in 2009. Healey’s self-deprecating, humble style belied her true cinematographic abilities. She borrowed her husband’s portable movie camera, and began the film with a plate reminding the audience that she had no prior experience. 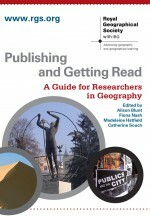 Yet her work, as Brickell and Garrett articulated, was talented, insightful, and ultimately ‘a rich resource for geographical [and cultural] research’ (2). Their focus on Healey served two key motives: (1) to remind geographers of the critical role women have played (and will continue to play) in geographic exploration, research, and documentation; (2) a general request for geographers and explorers alike to begin filming their experiences again, and not to solely rely on internet blogs or ‘sensationalist media’ (2-3). Katherine Brickell and Bradley L Garrett, ‘Geography, Film and Exploration: Women and Amateur Filmmaking in the Himalayas‘, Transactions of the Institute of British Geographers New Series (2012): 1-5. Ed Douglas, ‘Eileen Healey Obituary‘, The Guardian, 22 November 2010, accessed 18 April 2012. In 2009, an all-female Commonwealth expedition successfully skied to the South Pole. Find out more at the Kaspersky Commonwealth Expedition. This entry was posted in Transactions of the Institute of British Geographers and tagged Bradley L Garrett, Claude Kogan, Claudine van der Stratten, Earth Observation, Eileen Healey, Environment and Society, Ernest Shackleton, Exploration, Global Issues, Himalayas, Kaspersky Commonwealth Expedition, Katherine Brickell, Women on April 18, 2012 by Benjamin Sacks.